Dubai - UAE, February 28th 2012: Al-Futtaim Motors, exclusive distributors of Toyota in the UAE, has announced the launch of the new 2012 Land Cruiser in the UAE. The new Land Cruiser was presented by Sadayoshi Koyari, Chief Engineer, Product Planning Group and Simon Frith, Managing Director Al-Futtaim Motors at a ceremony that included hands-on demonstrations as well as on-road and off-road driving experiences. The new Land Cruiser is a vehicle that continues its 60 year history of quality, durability and reliability while adding multiple new technologies and features. With sharper design inside and out and advanced handling technologies the car promises exceptional off-road capabilities in the utmost comfort. Sadayoshi Koyari, Chief Engineer commented, “I am proud to be part of this launch and to announce the release of the new 2012 Land Cruiser, a vehicle that has inherited and evolved the traits and qualities that have made it the King of the 4WD. Toyota appreciates the expectations that its customers have with every model change and is determined to exceed those expectations by continuously improving the car’s driving capabilities and looks”. The 2012 Land Cruiser features several changes inspired by evolving customer demands and continues the legacy of being one of the most popular off-roading vehicles in the region. Fresh elements to Land Cruiser’s exterior and interior design continues to convey a rugged yet luxurious image while delivering high performance and durability aided greatly with new technology for advanced off-roading. It is at the front of the vehicle that the external styling changes on the new 2012 Land Cruiser are most evident, yet still reflecting the heritage of the Land Cruiser identity. The front bumper has been redesigned with enlarged overhangs, creating a much thicker front bumper that expresses the Land Cruiser’s power. The radiator grill has been redesigned to create a much rounder surface; a design which creates a powerful and finely-crafted image. The headlamps have been modified with HID low beams and integrated LED lights in the front of the vehicle. The 2012 Land Cruiser also comes with the option of a swing back door, with the aim of enhancing accessibility to the 3rd row seats. The wheels have been redesigned, with larger 18in aluminum wheels. Other changes include LED positioning lights incorporated within the headlights and chrome finished sides to the front and rear combination clusters and wider wheel flares. 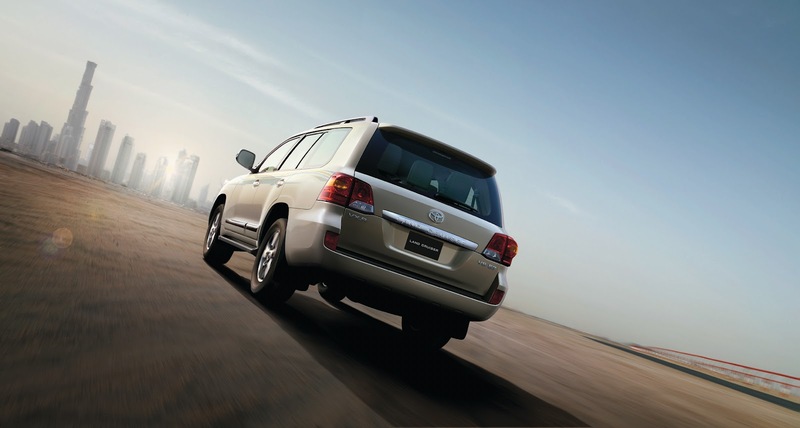 The 2012 Land Cruiser also comes in three new colours: White, Attitude Black and Light Blue. Changes made to the 2012 Land Cruiser cabin focus on heightening the level of quality in the look and feel of the interior, and improving the ergonomics and functionality for the controls and switchgear. A new lighter interior colour has been introduced, matched with high-gloss wood grain trim elements and bright silver finish details. Extensive changes have been made to the dashboard layout to express a sense of security and enhanced visibility. The AC vent is also plated creating a more luxurious atmosphere. The steering wheel with a wood grain/leather combination is available and larger wheel switches have been adopted to enhance ease of use, along with a larger transmission shift knob, door handles and audio switches. Air conditioned seats have also been added. The ability to tackle the toughest off-road conditions has been fundamental to all Land Cruiser models and with the 2012 model Toyota has harnessed advanced technologies to extend the vehicle’s capabilities even further. The raft of new handling features includes the newly introduced Turn Assist, which works in conjunction with the Crawl Control function, in addition to the new 5 mode Multi-terrain select (MTS) replacing the existing 3 mode system and Multi-terrain Monitor. The all new Turn Assist System enhances turning ability and minimizes the driver’s effort in tight U-turns where K-turns are necessary, by applying the brake on the inside rear wheel. The monitor is used in conjunction to help drivers observe their surrounds through front, side and rear cameras. The Multi-terrain Monitor consisting of 4 cameras (Front; rear; right side; left side) captures peripheral images and displays them on the Electro Multi Vision ( EMV) along with warning messages. The suspension of the Land Cruiser has been revamped, with a newly designed independent double wishbone type front suspension, and uprated coil springs all round have been inserted to dramatically improve handling both on and off road whilst maintaining riding comfort and the strength to withstand the most rigorous use. The 2012 Land Cruiser will be available in UAE with the choice of 5-speed Automatic or 6-speed Manual on improved 4.0L Engine with 271 HP in Dual VVT-i, and 6 speed Automatic transmission coming with a newly developed 4.6L V8 Engine with 304 HP in Dual VVT-I, and also in 5.7L V8 Engine. The pictures of the land cruiser are amazing I loved it and I have traveled inland cruiser when I was in Dubai and I enjoyed the Evening Desert Safari Dune bashing in it and that was a great Tour. That's so nice pictures. Thanks for sharing your blog with us. You are a talent writer, I learn a lot from your arrangement ideas and your writing.